An attempt to free Taylor? On August 11, 2003 Charles Taylor resigned as Liberia's 22nd President after rebel forces had taken control of most of the country's territory and following international pressure. He was granted political asylum in Nigeria by President Obasanjo despite being indicted by the Sierra Leone War Crimes Tribunal. 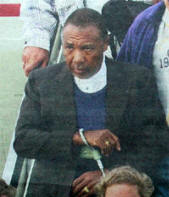 In March 2006 mounting international pressure resulted in his arrest at the Nigerian-Cameroon border which Taylor was about to cross in an attempt to escape from justice. He was arrested by the Nigerian authorities - embarrassed by his escape from Calabar - and immediately flown to Liberia where he made a brief stop-over. Within an hour after arrival at Robertsfield International Airport he was flown by helicopter to Freetown and delivered to the Sierra Leone War Crimes Tribunal. 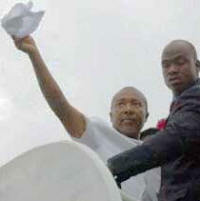 Charles Taylor may stand trial in Freetown or, more likely, in the Netherlands. US President George Bush, known for his adamant rejection of the International Criminal Court in The Hague, made a remarkable U-turn and publicly pleaded for Taylor's transfer to The Hague, the Netherlands, to stand trial. In principle the Dutch have agreed to host the Taylor trial. However, only under certain conditions, like e.g. a UN Security Council resolution authorizing it and that Taylor will not stay in the Netherlands after the trial. The trial will be held under the jurisdiction of the Sierra Leone War Crimes Tribunal. Prosecution by the The Hague based International Criminal Court is limited to crimes dating after July 1, 2002, the date on which the Statute of the ICC entered into force. 'God willing, I will be back', Charles Taylor boasted on August 11, 2003 when he boarded a Nigerian plane, accompanied by Presidents Kuofor of Ghana and Mbeki of South Africa, which brought him to his luxurious exile in Calabar, Nigeria. He did not foresee that he would come back handcuffed. The final verdict: 50 yrs in jail! Will Charles Taylor end up being Africa's only former president convicted of war crimes? The conviction of Charles Taylor: A victory for justice - not an end to impunity.